Out in the garden today, if you hadn't been told or didn't see it for yourself, you wouldn't really notice that yesterday we had one of those 100 year rains. Technically, we had a 95 year rain, since the last time it rained like that around here was in 1913. I measured between 5.5 and 6 inches in my rain gauge once it was all over. But it was much worse south of here, where people had to leave their homes for higher ground, with just what they could carry on a boat, and a hospital had to be evacuated. Places flooded that had never been known to flood before, or even come close to flooding. My sister took some pictures on her street, which we all remember flooding like that once when we were kids. It was quite a slow moving storm and just dumped everything it had on us. And now today the sun was shining, and most of the water is gone, moving down river, so to speak. Yesterday, while standing in the back doorway, I took this picture of my vegetable garden. All the mulched paths were flooded, and my green tower had fallen over. Today, the garden looks normal again. I weeded all the beds and raked the mulch to fill in where some spots were left bare after the rain. Those twigs on that one bed are to keep the neighbor's cat from using that particular raised bed as a litter box. So far it is working. I do feel like the vegetable garden is behind by at least a week over last year. Last year at this time I was tying up the tomatoes. This year, they are not nearly tall enough to try to tie to any stakes. The strawberries have been coming on strong and this is my best crop ever. The picture above are the berries I picked this morning from my one 4' x 8' strawberry patch. Yes, I count them as I pick them, and that bowl has just over 160 berries in it, bringing my total so far up to over 350, and there are more to pick. I had so many strawberries that I used some of them to make strawberry freezer jam this afternoon. I just did a taste test and have decided that it is good. If I can keep myself from eating it all this summer, that jam is going to be a real treat this winter. Strawberries are a crop that needs just a little bit of attention, a few times a year, but it is well worth the extra effort. 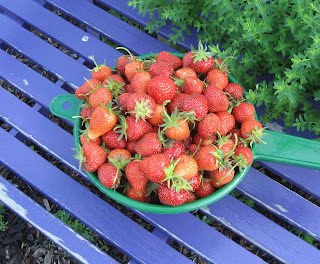 I really don't have that much experience growing strawberries, so I refreshed my memory on what to do by referencing information from my local cooperative extension service. By the way, when I need more information on something gardening related, I often check cooperative extension bulletins. People forget sometimes that "county agents" who work for the cooperative extension service are there to help not just farmers, but home gardeners, too, and they have written hundreds of bulletins about all kinds of vegetable and fruit crops. In other garden news, the spoons seem to be keeping the rabbits away from the beans, or maybe it was the rain? Regardless, the beans remain uneaten. However, a couple of the squash plants seem to have been nibbled on, so if it isn't too late, tomorrow I'm going to 'spoon' them, too. And I've taken the first step on my plant cataloging project by gathering up all the old plant tags and receipts that I could find. They are all in one basket now, so tomorrow, I'll start sorting them, right after I pick more strawberries. I love strawberry freezer jam! We also slice some with sugar and freeze them for shortcake. MMMMMM. How long have you had your berry patch? I hope mine will produce that much fruit next year. Those strawberries look yummy! Our raised beds had rivers just like yours, but after the heat and wind yesterday they are back to normal. Hi all. I've gotten an email that some have had trouble commenting on my blog in the last few days. If anyone is having problems, please drop me an email note. The rain caused my corn to be under water yet again, it didn't recede until Sunday, and more rain to come tonite ugh! Your strawberries look yummy! Carol, I can't believe you were out in the vegetable garden the day after all that rain! Raised beds obviously are the way to go. Those strawberries look delicious. I was grazing through a friends garden this weekend. Their strawberries are about finished for the season. I haven't had any trouble getting onto your blog lately. Wow, that is a lot of water!I'm glad it went down and it all looks normal now. I see your strawberries are in a raised bed. That's pretty neat. I had never thought of doing it that way. I'm working on getting at least a couple raised bed this summer. I'm glad the brush is working so far to keep the cats out! I have been having a great deal of trouble with my internet connection and many of my posts aren't loading but I keep trying! Your garden looks great after your big rain...and very productive! One of these days you are going succeed in convincing me (reading about your successes) to grow a vegetable garden. Your update answered all my questions that have been brewing. I'm glad your raised beds held out. The first year I put my raised beds in, we had such a hard rain that the water built up inside and then the weight of it pushed all the dirt under one side (they're on a hill). Rain always seems like a good thing but this storm goes to show that even good things, in excess, can be bad. You've made me want to eat strawberries so badly that I went out and bought some this weekend. I'm sure yours were better. What is it with the rain this year? I'm glad you didn't have any major flooding. I swear I can actually see the grass growing. I'm glad to hear that the rabbits are being kept at bay. I wish I could find a similar deterrent for the squirrels. With all the rain, the chemical deterrents just aren't effective, & rocks & forks don't stop them digging either. Sorry to hear about the flooding. I sure wish you could send several inches of rain to Austin. One Acre Homestead, this is the 3rd year for the strawberry patch, and the best year by far. Sherry at the Zoo, it's amazing how quickly the water runs off. Just on the other side of the fence, there is a bee hive drain, so the water didn't have far to go. Karen, My corn hasn't been under water, but this isn't going to be a good year for it, too wet! Rose, raised beds is the only way to go for vegetable gardens. I certainly couldn't hoe up the beds, too wet for that, but I would walk through the paths and pull weeds. 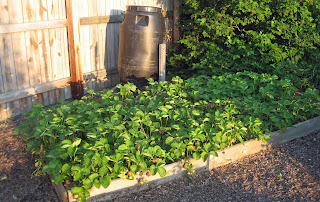 SuzyQ, keep in mind the best time to plant strawberries is in the early spring because most are sold as bare root starts. So, plan for next year. Lisa at Greenbow, I think I'm nearing the end of these strawberries, too. I picked another 150 this evening, so I guess I need to make more jam. 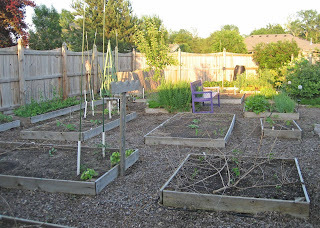 Brenda Jean, yes, I am a big promoter of raised beds for any kind of "crop" planting. Gail, that would be wonderful to see you start a vegetable garden! What else should I post about to convince you? MSS @ Zanthan Gardens, I'll have to admit, my strawberries taste good, and I know they are pesticide free. MMD, I am so glad I don't have squirrels in my garden, though I think as the trees mature in my neighborhood, I'm sure the squirrels will find us. 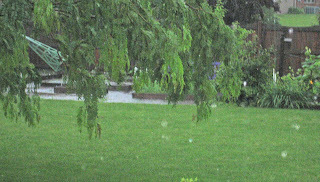 Pam/digging, I sure wish I could send some of this rain your way, too. As I type this, I can hear thunder off in the distance and wonder if more rain is coming our way. I don't even want to look at the weather radar to see. I'm sick of it! I thought of you last night as we watched the news here in Oregon about the terrible floods in Indiana. I wondered if they were anywhere near you. Looks like your raised vegetable beds saved the day. We've had unseasonably cold weather but nothing like the rain you've had. Hope it doesn't get any worse. By the way, your strawberries look yummy! Sorry you are getting so much rain, but on the bright side your garden will take off. Your strawberry patch looks wonderful. I think I will have to put on in next fall. Hope it drys out for you.